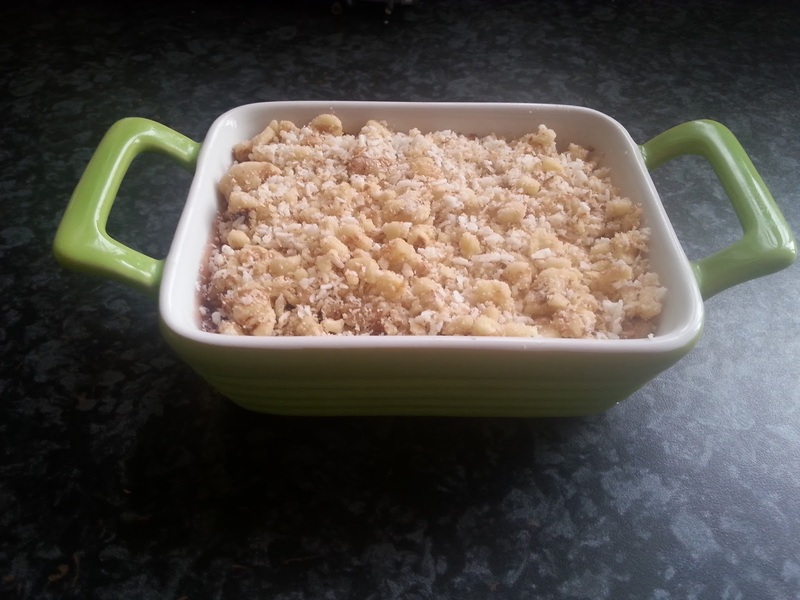 ~My rhubarb and walnut crumble, delicious! I call it that because it doesn’t feel restrictive, it feels sensible, that being said I wanted to share some more (healthy recipes) that go along side the diet plan. So, buckle your seat belts, you’re in for a sweet ride. To start; You will need to chop and prepare your rhubarb, this may require washing and chopping leaves off! I chopped my rhubarb into 1″ lengths and put them in a large sauce pan, half filling it with cold water. Bring the water up to the boil rotating the rhubarb, once the water has boiled the rhubarb will cook very quickly, so stay with it and do not stir it at this stage, it breaks up very quickly and becomes mushy! Once the rhubarb is soft to the touch, bring it out of the pan, leaving the rhubarb juices behind, lay them in a deep pie dish, drizzle over the tbsp of honey and sift over 2tbsp of the brown sugar. Now, back to those juices, noone likes a soggy and runny rhubarb crumble, so we’re going to turn it into a thicker consistency! Pop your remaining sugar into the liquid and bring it back up to the boil, stiring in the sugar that has settled to the bottom. Once there, bring it down to a simmer and leave to simmer for 5-10 minutes (or until 1/3 of the water has evaporated). Pour the liquid gold, oh I mean rhubarb juices.. into the pie dish with your rhubarb, leave to cool. Whilst your delicious desert is cooling slightly you can bring out your nutty toppings, put them all into a bowl or blender and crush until a crumbly texture is desired, the coconut is chewy so it really brings the walnuts together. 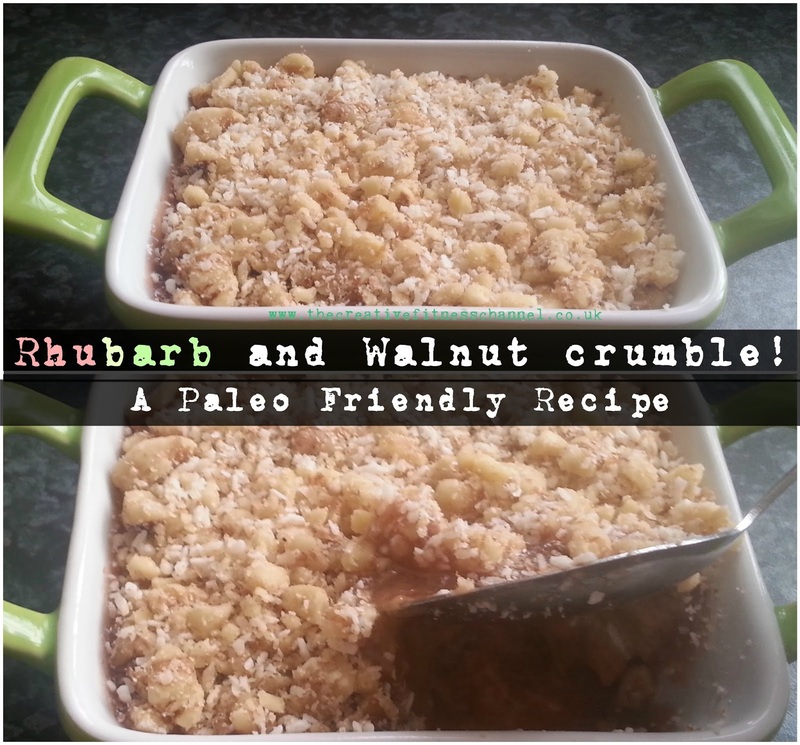 I know I’m paleo and supposed to be good about my sweet treats but I snook abit of traditional crumble over the top of mine (can’t help myself).. but, If you haven’t already have a look at ‘Paleo explained’ my first week of Paleo Meals and my Paleo review too! Oh and of course, if you liked our recipes, then why not like us on facebook too?